I love Cauliflower, it’s a reminder that there are lots of delicious things to eat in the winter. 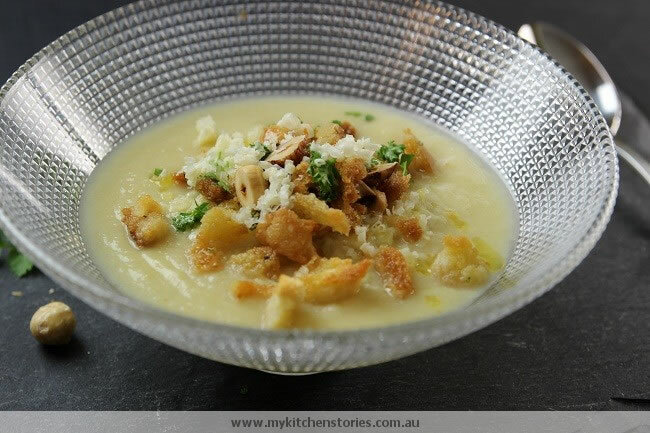 Fortunately, I got to cook this soup for someone else, as Skater will only tolerate cauliflower splashed with cheese sauce and baked till golden. 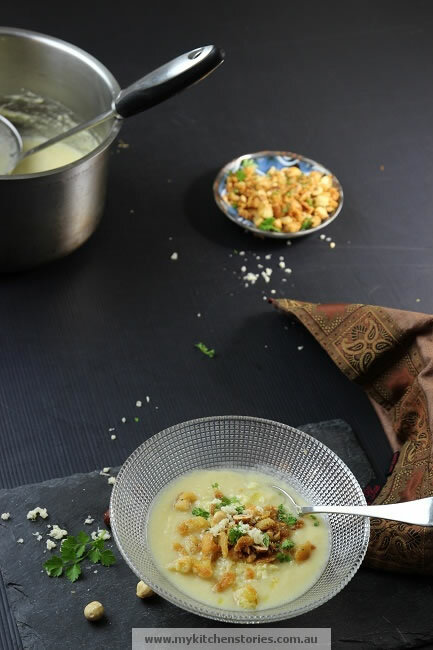 This is a more healthy version of cauliflower cheese, made with 1 pot only……love <3. Another delicious idea is to add another 500 gm of potato to this and make a tasty mash to go with chicken or fish…..use the same garnish for an irresistible savoury crumble to add crunch. Heat the stove to medium low. Use a large pot big enough to hold all the ingredients and add a tablespoon of olive oil and the butter then the onion, leek and garlic sweat until soft but not browned. Simmer until the vegetables are soft ( approx 20-25minutes). Add the cream and cheese, then puree . This is best done with a stick blender, in the pot. Add salt and pepper to taste. Crispy bread crumble......... take a piece of bread a nice dry sour dough or white and pull apart into little crumble like pieces. Put them in a bowl and toss with salt and pepper and oil. Toss and coat the crumbs then put onto a lined oven tray and bake till golden. They can be grilled but oven is best.......add cumin or smoked paprika or any thing you like when using these for other things too. 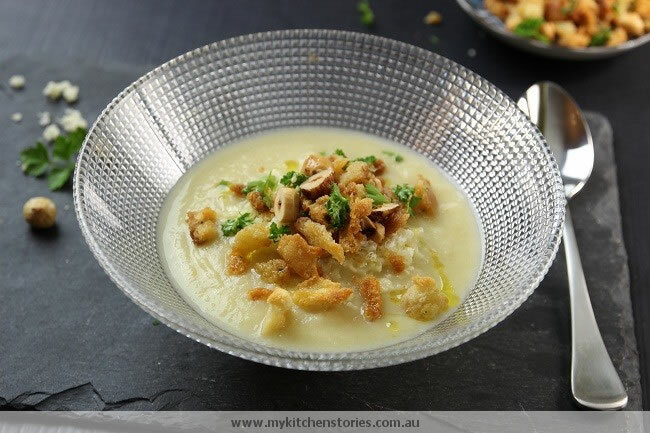 omg that looks incredible i looooove cauliflower soup! Its great to have a contrast of textures here, yummo! Your soup looks fabulous Tania! 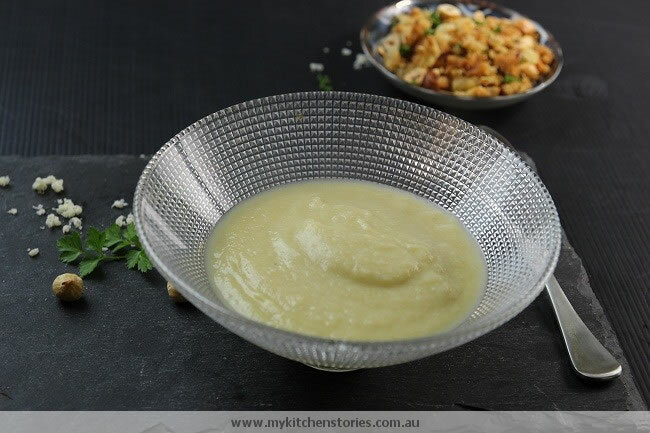 I love cauliflower soup, but love your version with hazelnuts. I can’t wait to make this when the cold weather hits here again! I like cauliflowers too, but never try it in soup. Yours with cheddar looks fabulous. 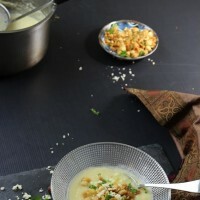 What a nice variation on cauliflower-cheese soup. I love the idea of preserved lemon and roasted hazelnuts. This looks sooooo comforting. I too love cauliflower. As soon as the weather cools down a bit I’m going to try your recipe. Loving the slate in your pretty photos.